Reward challenge: "Mud Slinging" - Malcolm and his brother, Miles, out-fling muddy balls at sticks, earning Miles a night in camp. Oh, plus Skupin's son, Michael, and Lisa's brother, Justice, who seem to spend all their time praying together. Except Michael, who also manages to injure himself. Voted out: Carter, 5-1 over Abi-Maria. Notes: Despite the fact that the reward challenge was done in pairs with the loved ones, we're counting it as an individual challenge (as in past contestant-loved one paired challenges). 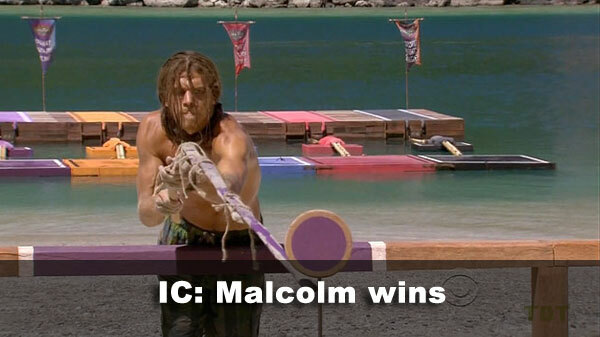 So: a challenge sweep by Malcolm. 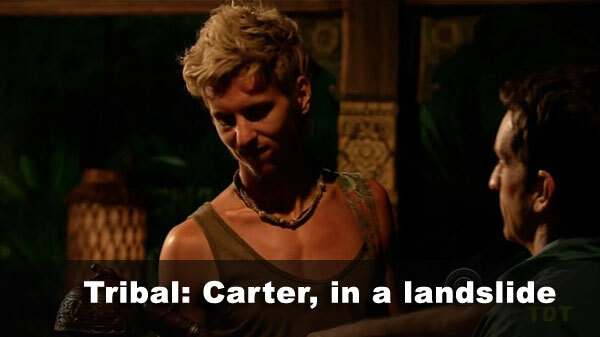 - Carter received 5 votes, from Denise, Skupin, Lisa, Malcolm, and Abi-Maria (voted out, 5-1). - Abi-Maria received 1 vote, from Carter.